I will forever be a fan of a well-written thank you card. As much as I love the convenience of email, texting, and social media, there’s something about the thank you card—it’s one of the few lasting signs of good manners. And thankfully, it’s an easy skill to master, even for your kids. That’s one of the reasons thank you cards have remained as we’ve ditched other etiquette rules. They are quick to write and can be relatively informal, but they still show more consideration than a text message. 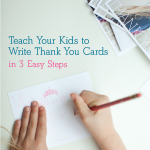 It’s easy to make writing a thoughtful note a habit for your kids. Get them started early, and they’ll likely keep it up for the rest of their lives. Follow these three steps to write a simple and sincere note. Okay, this is kind of a no-brainer, but first and foremost say thank you for the gift, and be sure to mention what it is. If your child received the gift in person, at a birthday party, for example, be sure to have them say thank you for attending the party as well. If it’s a toy, have your child share how they’ve been playing with it. If it’s a book, have them share their favorite part of the story so far. 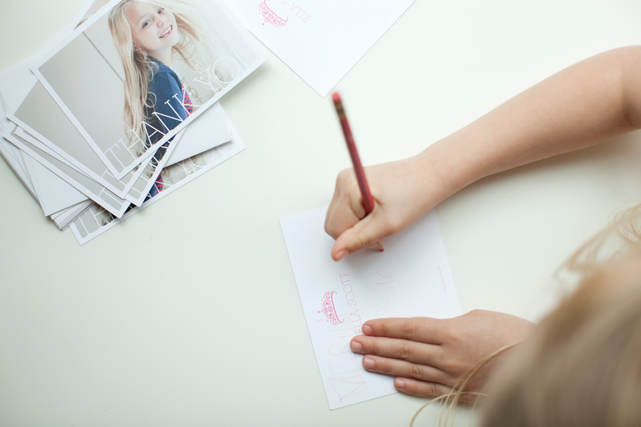 For younger children, if you’re actually writing the note have them do a drawing or include some kind of artwork to make the thank you card more personalized—grandparents especially love this. 3. MAKE PLANS TO ENJOY IT TOGETHER. Have your child end the note with the wish to play with the toy or read the book the next time he or she sees the giver. What’s better than sharing the enjoyment of a gift with the person who gave it? One slight deviation to this rule is if someone gives your child money for his or her birthday. In that case, have them write how they plan to spend it or what they are saving it for. Thank you so much for the latest Templeton Twins mystery. I loved reading the first book with you at Christmas. I can’t wait to tell you about this one on the phone when Mom and I finish it. I love you. Thank you for coming to my birthday party. I was glad you got to meet my friends from school. Thanks for the Lego Builder set. Let’s put it together next time you come over after swimming. You have a week. Since thank you cards are decidedly unfussy, they’re easy to write and pop in the mailbox—the ideal is within a week of receiving the gift. Any card will do. From personalized stationery to blank note cards to cards that say thank you, any of the options you have in your card stash will do. I’m partial to this Monogram Thank You Card with a photo on the back. The only ones to skip? Those with a pre-printed greeting.